The ninth edition of the Fred. Olsen Tenerife Bluetrail, the island´s most extreme long-distance mountain race, will take place on Saturday 8th June 2019. Almost 2,000 athletes from 36 countries have already registered for the event, which has a maximum capacity of 2,900. As Spain’s highest and Europe’s second highest race, the Fred. Olsen Tenerife Bluetrail attracts the best athletes from all over the world. Participants in this year’s event can choose from the following five categories; ‘Ultra’ (102km), Trail (67km), Marathon (43km), Half Marathon (20km) and the adapted trail, Challenge, which is designed for people with disabilities (8km, 3.7km and 1.2km). Landscape is always one of the key highlights of the Fred. Olsen Tenerife Bluetrail with routes that pass through a variety of terrain and scenery. 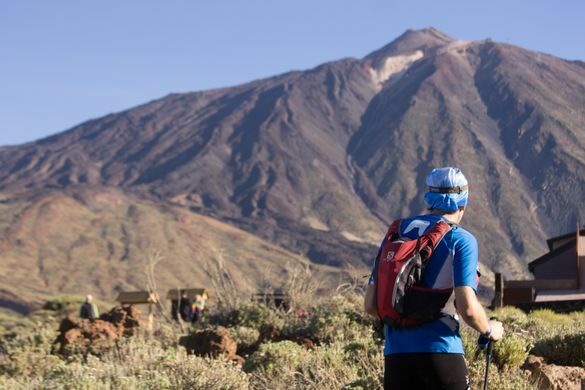 This year the race will start at Playa Fañabé (Adeje) but, throughout the race, runners will experience the contrasts from the dryness of the south to the plush green vegetation of the north – without forgetting the UNESCO-listed Teide National Park, which is the true hero of the race. Also included in this year’s route, for the second year only, is a trail through the beautiful and abrupt landscape of the Barranco del Infierno Nature Reserve (Hell’s Ravine). Ultra: The Ultra route is the star of the Fred. Olsen Tenerife Bluetrail in 2019. Covering a total distance of 102km, the race allows participants to cross the UNESCO World Heritage Site of the Teide National Park and ascend the summit of Mount Teide, before reaching an altitude of 3,555 metres. The Ultra, which starts at 11:30pm on 7th June and departs from Playa Fañabé in Adeje, is distributed into paths (70%), tracks (17%) and roads (13%) and must be completed by runners within 23:30 hours. Maratón: The marathon covers a distance of 43 kilometres and kicks off on 8th June at 9am. Runners will benefit from enjoying Tenerife’s varied terrain throughout the route, with it including trail (50%), track (29%) and roads (21%). Media: This 20km race will start on 8th June at 8am. It will depart from Plaza de San Agustín, Los Realejos, and the runners will have four hours to get to the finish line. This race will be comprised of paths (32%), tracks (18%) and asphalt (50%). The maximum height reached will be 1,092 metres above sea level. Challenge: Integration will once again be one of the core values of the Tenerife Bluetrail. The Challenge will return in 2019, this time with an 8km, 3.7km and a 1.2 km race, which will coincide with the end of all races. They will take place at 6pm on 8th June, and will see participants departing from the Mirador de San Pedro in the municipality of Los Realejos and arriving in Puerto de la Cruz. The Ultra modality (102 km.) will be the first test of the Spanish Ultra Mountain Race Cup 2019 and will be part of the Alpinultras Circuit. The Trail mode (67 km.) is part of the Skyrunner National Series Circuit. The Fred. Olsen Tenerife Bluetrail is included in the Skyrunners® National Series and it will also continue to be a qualifying race for the Ultra Trail du Mont Blanc®. The Ultra offers contestants five points, while the Trail and Marathon races offer four and two points respectively. In addition, the Trail will be the Ultra Canary Islands Championship (single event), which ensures the presence of the best runners in the Archipelago at the Tenerife event. Athletes looking to register for the Fred. Olsen Tenerife Bluetrail can do so by filling out an entry form on www.tenerifebluetrail.com. Entry prices are €120 for the Ultra race, €70 for the Trail, €50 for the Marathon, €35 for the Half Marathon and €15 for the Challenge category, which is fully subsidised by the Sports Area of ​​the Cabildo de Tenerife.